In the aftermath of the U.S. invasion of Iraq in 2003 – an invasion which many Iraqis believe left their country in the worst condition it has been since the Mongol invasion of 1258 — there was much discussion in the media about the Bush Administration’s goal for “nation-building” in that country. Of course, if there ever were such a goal, it was quickly abandoned, and one hardly ever hears the term “nation-building” discussed as a U.S. foreign policy objective anymore. The stark truth is that the U.S. really has no intentions of helping to build strong states in the Middle East or elsewhere. 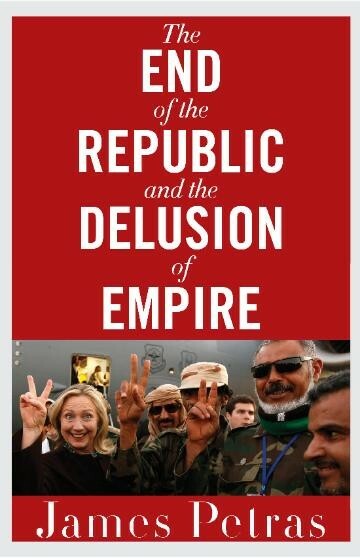 Rather, as we see time and again – e.g., in Yugoslavia, Sudan, Libya, Yemen, Syria, Somalia, Ukraine – the goal of U.S. foreign policy, whether stated or not, is increasingly and more aggressively the destruction and balkanization of independent states. However, it is important to recognize that this goal is not new. Similarly, the U.S. objective in Vietnam was the destruction of any prospect of an intact, independent state from being created. As Jean-Paul Sartre wrote as part of the International War Crimes Tribunal that he and Bertrand Russell chaired after the war, the U.S. gave the Vietnamese a stark choice: either accept capitulation in which the country would be severed in half, with one half run by a U.S. client, or be subjected to near total annihilation. Sartre wrote that, even in the former case, in which there would be a “cutting in two of a sovereign state . . . [t]he national unit of ‘Vietnam’ would not be physically eliminated, but it would no longer exist economically, politically or culturally.” Of course, in the latter case, Vietnam would suffer physical elimination; bombed “’back to the Stone Age’” as the U.S. threatened. As we know, the Vietnamese did not capitulate, and therefore suffered near-total destruction of their country at the hands of the United States. Meanwhile, for good measure, the U.S. simultaneously bombed both Cambodia and Laos back to the Stone Age as well. While it would have been impossible for the U.S. to continue to monopolize a full half of the world’s wealth after Europe, Japan, China and the USSR inevitably got up upon their feet after WWII, the U.S. has nonetheless done an amazing job of controlling an unjustifiable and disproportionate amount of the world’s resources. The only way the U.S. has been able to achieve this impressive, though morally reprehensible, feat has been to undermine, many times fatally, the ability of independent states to exist, defend themselves and to protect their own resources from foreign plunder. This is why the U.S. has teamed up with the world’s most deplorable forces in destroying independent states around the globe. Just to name a few examples, since 1996, the U.S. has supported Rwandan and Ugandan forces in invading the Democratic Republic of Congo, making that country ungovernable and plundering its incredible natural resources. The fact that around 6 million innocents have been murdered in the process is of no matter, and certainly not to the main stream press which rarely mentions the DRC. In Colombia, the U.S. has backed a repressive military and right-wing paramilitaries for decades in destabilizing whole swaths of the Colombian countryside, and in assisting multinational corporations, and especially extractive industries, in displacing around 7 million people from their homes and land, all in order to exploit Colombia’s vast oil, coal and gold reserves. Again, this receives barely a word in the mainstream press. Of course, in the Middle East, Northern Africa and Afghanistan, the U.S. has been teaming up with Saudi Arabia and radical Islamist forces – forces the U.S. itself has dubbed “terrorist” – in undermining and destroying secular states. As far back as the 1970’s, the U.S. began supporting the mujahidin in attacking the secular, Marxist state of Afghanistan in order to destroy that state and also to fatally weaken the Soviet state by, in the words of Zbigniew Brzezinski, “drawing the Russians into the Afghan trap . . . [and] giving to the USSR its Vietnam war.” Afghanistan may never recover from the devastation wrought by that fateful decision of the U.S. and its subsequent intervention which is now into its 15th year and counting. As we know full well, the USSR never recovered either, and the U.S. is trying mightily to prevent post-Soviet Russia from becoming a strong rival state again. Meanwhile, in Libya, the U.S. again partnered with jihadists in 2011 in overthrowing and indeed smashing a state which used its oil wealth to guarantee the best living standards of any country in Africa while assisting independence struggles around the world. In this way, Libya, which under Qaddafi also happened to be one of the staunchest enemies of Al-Qaeda in the world, presented a double threat to U.S. foreign policy aims. Post-intervention Libya is now a failed state with little prospects of being able to secure its oil wealth for its own people again, much less for any other peoples in the Third World. And so, mission accomplished! One contradictory aspect of the new strategy is that, in Iraq, most of the insurgent violence directed at the American military has come from Sunni forces, and not from Shiites. 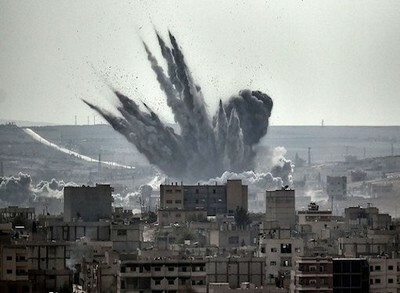 The U.S. continues to intervene in Syria in a way which prevents the Syrian state from achieving a decisive victory against the various militant groups it is fighting – some of which the U.S. itself admits are terrorists – while at the same time targeting some of these same militant groups themselves, thereby preventing either side of the conflict from coming out on top. Indeed, as we have learned, the CIA and the Pentagon have even been backing opposing militant groups that are fighting each other! The result is a drawn-out war which threatens to leave Syria in chaos and ruins for the foreseeable future. This would seem to be an insane course of action for the U.S. to take, and indeed it is, but there is method to the madness. The U.S. appears to be intentionally spreading chaos throughout strategic portions of the world; leaving virtually no independent state standing to protect their resources, especially oil, from Western exploitation. And, this goal is being achieved with resounding success, while also achieving the subsidiary goal of enriching the behemoth industrial-military complex. 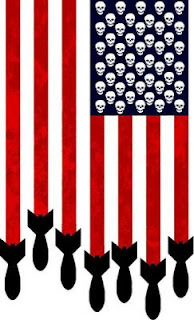 Jose Marti once said, “there are two kinds of people in the world: those who love and create, and those who hate and destroy.” There is no doubt that the U.S. has proven itself to be of the latter kind; indeed, the very nature of U.S. foreign policy is destruction. Given this, it is at best foolish and naïve for people of any political stripe, but particularly self-defined leftists, to put any stock in the notion that the U.S. is acting in the defense of human rights, democracy or any such lofty goals in intervening militarily abroad. There is only one proper goal, then, of people of good will – to oppose U.S. military intervention with every fiber of our being. Why the Nobel for Colombia's Santos? 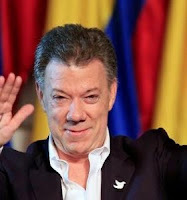 Does Colombian President Santos Deserve the Nobel Peace Prize? The prize is important because it can help overcome the referendum vote against the peace agreement, says Cristin Espinel of the Colombian Human Rights Committee. Cristina Espinel is one of the founding members of the Colombia Human Rights Committee, founded in 1981. She is a representative of the Campaign Si A La Paz in Washington DC. Are White Helmets Really White Hats? Do the Numbers Add Up? Did Colombia Really Say No to Peace? Sunday's shocking “no” vote on the Colombian peace deal may not be all that it seems because of number of potential errors in the counting process. Colombia currently lies in limbo after the plebiscite for peace with the FARC-EP was rejected by less than half a percent. But a deeper look at the statistics suggest that a “no” vote might not have actually been Sunday’s victor. The "No" vote won with 50.21 percent to 49.78 percent for the "Yes" vote. The "No" had 6,431,376 votes to 6,377,482 votes for the "Yes." While there were only two options – yes and no – to respond to the plebiscite question, unmarked and nullified ballots are also extremely important to the overall count. There were 86,243 unmarked ballots and 170,946 nullified ballots, according to analysis published in The Conversation by Royal Holloway University Professor of Economics Michael Spagat and University of Miami Physicist Neil Johns. Colombia used paper to record Sunday’s votes and votes were counted by hand. Given the known research behind counting errors, around 65,000 to 130,000 votes would have been accidentally counted incorrectly, and could have easily pushed the vote to a “yes” result, wrote Spagat and Johns. The method that the vote counters used to classify and count the surprisingly large number of blank and invalidated votes is unknown, but could have made a significant impact. While the voting papers were printed with clear “yes” and “no” options, many of the unmarked ballots may have been marked very lightly and therefore would not have been registered. Voter turnout from Sunday was very low, under 40 percent, with only 13 million of 35 million eligible voters making it to the polls, meaning that there was only around 18 percent of all eligible voters who registered a “no” vote. On Monday the electoral commission of Colombia estimated that at least 4 million people could not cast their vote because of heavy rains caused by Hurricane Matthew. Before the plebiscite the “yes” vote was in a clear winning position according to polls, even according to right-wing media. Many Colombians in favor of peace may have considered a “yes” result a certainty and decided to stay home as a result. The areas most affected by the conflict have overwhelmingly voted "Yes" for peace. For example in the heavily affected area of Choco, with 95 percent of the vote counted, 79 percent voted "Yes." The Caribbean provinces have also voted "Yes." 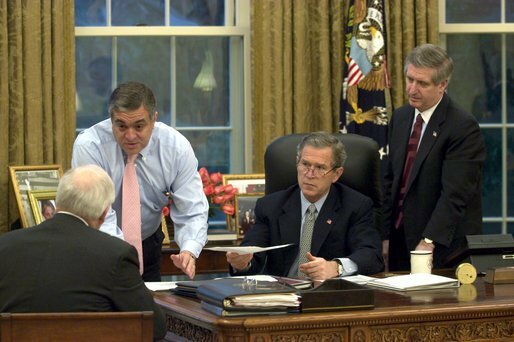 receive an Oval Office briefing from CIA Director George Tenet. Last week, the Joint Investigation Team, an internationally composed body looking into the downing over Ukraine of Malaysia Airlines flight MH17 more than two years ago released some of their findings, enough to implicate, they say, Russia in the crime. The western press immediately repeated the findings, and its accusations fully, while doing little digging of its own into either the rigor of the JIT's methods, or resilience of its facts. The media's curious incuriousness surrounding the Dutch-led panel's probity, considering the scope of the story and its possible ramifications for international relations between Russia and the west at this most sensitive historical moment, may be the most telling part of the tragic mystery behind flight MH17. John Helmer is a long-time, Moscow-based journalist, author, and essayist; the only one, his site, Dances with Bears informs “to direct his own bureau independent of single national or commercial ties” since 1989. He’s a former political science professor who's served as an advisor to the governments of Greece, the United States, and in Asia who regularly lectures on Russian topics in China, Europe, and the US. 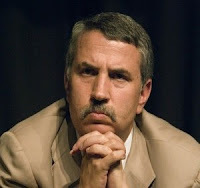 His book titles include: ‘Uncovering Russia,’ ‘Urbanman: The Psychology of Urban Survival,’ ‘Bringing the War Home: The American Soldier in Vietnam and After,’ and ‘Drugs and Minority Oppression’ among others. Daniel Kovalik teaches international human rights law at the University of Pittsburgh School of Law, and is Senior Associate General Counsel for the United Steel Workers union. Kovalik is just back from Colombia where he witnessed the peace plebiscite. Dan's also a long-time peace and justice activist, specializing in that in Colombia and Central America, where he serves as an attorney for Colombian plaintiffs in cases alleging corporate human rights violations. Kovalik is also co-recipient of a Project Censored Award for chronicling the murder of trade unionists in Colombia. The mood in this improvised Colombian town on the Caribbean coast is somber tonight. The national peace plebiscite was just defeated by a mere 0.43% or 60,000 votes. The government of Colombia and the FARC insurgents signed peace accords six days ago to much public jubilation. Today the peace accords were put to a public vote. Polls predicted a landslide approval of 60%. The public airwaves had been saturated with advertisements for “si” to approve the accords. Practically every wall to I passed here on the coast and earlier this week in the capital of Bogota was plastered with “si” posters. The “no” side appeared absent except for a fringe represented by former president Uribe and his right-wing cohorts. The Catholic Church, the current Santos government, and the entirety of progressive civil society – unions, Indigenous, Afro-descendants, campesinos – were campaigning for “si.” The outcome seemed preordained. The right-wing had been threatening activists – many had already been assassinated – to disrupt the peace process. Hence our delegation of North Americans to accompany targeted Colombian activists to provide them some protection by raising their international visibility. The Alliance for Global Justice along with the National Lawyers Guild came to Colombia at the invitation of FENSUAGRO, an agrarian workers federation, Marcha Patriotica, a large progressive coalition, and Lazos de Dignidad, a human rights organization. The accords would have ended the 52-year civil war – the longest in modern history. The FARC’s position during the intense four years of negotiations in Havana with the Colombian government was there could be no peace without justice. That it makes no sense to end the armed conflict if the conditions that generated that conflict were not addressed. The accords accordingly had provisions for agrarian reform, political participation for the insurgents, transitions from an illicit drug economy, and reparations for victims of the conflict. Campesino leaders in the rough and rundown frontier town of Maicau on the Venezuelan border, where drug running and sales of contraband are mainstays of the local economy, spoke about the agrarian struggle. The “oligarchs,” they explained, want to “ethically clean” the countryside of small farmers to make way for transnational agribusiness. Yesterday they spoke of the great hope they had for a “si” vote to defeat the oligarchy. Today Colombia voted against peace and against that hope. The Obama administration, while giving lip service in support of the peace process, has massively increased lethal aid and transfer of the latest military technology to the Colombian government under the rubric of Plan Colombia. Presumptive president-elect Hillary Clinton has been on the campaign trail stomping for Plan Colombia as the world model for the military subjugation of those who oppose the extension of the US neoliberal empire. The October 2nd “no” vote on peace in Colombia will have repercussions around the world. “This is a playoff situation in which you need both teams to lose, but at least you don’t want one to win — we’ll settle for a tie,” Alon Pinkas, a former Israeli consul general in New York told the New York Times in June 2013. Former Israeli Prime Minister and President, Shimon Peres, was a very successful brand. He was presented to the world as stately, wise, a relentless advocate of peace, and a sane voice amidst a conflict deemed senseless and unending. The truth is, Peres was never truly a peacemaker – he never labored to achieve fair and just political compromises that would preserve the dignity and rights of the Palestinians, along with securing the future of his people. In fact, he was a maximalist, a man who blatantly shoved his ideas forward in order to achieve his goals, no matter what the method or the price. But for many people, Shimon Peres was a false prophet. Like Ehud Barak, Tzipi Livni, Ehud Olmert and others, he was a ‘peacemaker’ by name only, and only by those whose ideals he fulfilled. Fearing that his reputation as ‘too soft’ to lead Israel – which is often led by battle-hardened generals – would affect his standing among voters, Peres often meted out severe punishment on the Palestinian and Lebanese peoples. 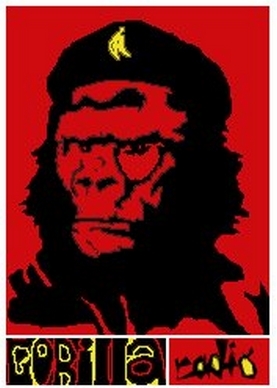 His history was rife with brutal war crimes that went unpunished. Although he is remembered for his ordering of the bombing of a UN shelter in the Lebanese village of Qana in 1996 – which killed and wounded hundreds of innocent people – the list of war crimes associated with his name is as long as his career. He remained, until the very end a staunch supporter of the Israeli right-wing government’s wars on Gaza and the perpetual siege on that impoverished, forsaken region. “Peres, like his mentor, believed an Israeli bomb was the key to guaranteeing Israel's status - both in Washington DC and among the Arab states - as an unassailable Middle East power,” Cook wrote. 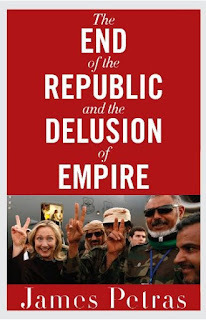 Introduction: Washington’s quest for perpetual world power is underwritten by systematic and perpetual propaganda wars. Every major and minor war has been preceded, accompanied and followed by unremitting government propaganda designed to secure public approval, exploit victims, slander critics, dehumanize targeted adversaries and justify its allies’ collaboration. A common technique, practiced by the imperial publicists, is to accuse the victims of the same crimes, which had been committed against them. The well documented, deliberate and sustained US-EU aerial bombardment of Syrian government soldiers, engaged in operations against ISIS-terrorist, resulted in the deaths and maiming of almost 200 Syrian troops and allowed ISIS-mercenaries to overrun their camp. In an attempt to deflect the Pentagon’s role in providing air cover for the very terrorists it claims to oppose, the propaganda organs cranked out lurid, but unsubstantiated, stories of an aerial attack on a UN humanitarian aid convoy, first blamed on the Syrian government and then on the Russians. The evidence that the attack was most likely a ground-based rocket attack by ISIS terrorists did not deter the propaganda mills. This technique would turn US and European attention away from the documented criminal attack by the imperial bombers and present the victimized Syrian troops and pilots as international human rights criminals. Empire is commonly identified with the race, gender, religion and ethnicity of its practioners. Imperial propagandists have frequently resorted to disarming and weakening anti-imperialist movements by co-opting and corrupting black, ethnic minority and women leaders and spokespeople. The use of such ’symbolic’ tokens is based on the assumption that these are ‘representatives’ reflecting the true interests of so-called ‘marginalized minorities’ and can therefore presume to ’speak for the oppressed peoples of the world’. The promotion of such compliant and respectable ‘minority members’ to the elite is then propagandized as a ‘revolutionary’, world liberating historical event - witness the ‘election’ of US President Barack Obama. Under Obama’s historical black presidency, the US pursued seven wars against ‘people of color’ in South Asia, the Middle East and North Africa. Over a million men and women of sub-Saharan black origin, whether Libyan citizens or contract workers for neighboring countries, were killed, dispossessed and driven into exile by US allies after the US-EU destroyed the Libyan state - in the name of humanitarian intervention. Hundreds of thousands of Arabs have been bombed in Yemen, Syria and Iraq under President Obama, the so-called ‘historic black’ president. Obama’s ‘predator drones’ have killed hundreds of Afghan and Pakistani villagers. Such is the power of ‘identity politics’ that ignominious Obama was awarded the ‘Nobel Peace Prize’. Meanwhile, in the United States under Obama, racial inequalities between black and white workers (wages, unemployment, access to housing, health and educational services) have widened. Police violence against blacks intensified with total impunity for ‘killer cops’. Over two million immigrant Latino workers have been expelled - breaking up hundreds of thousands of families– and accompanied by a marked increase of repression compared to earlier administrations. Millions of black and white workers’ home mortgages were foreclosed while all of the corrupt banks were bailed out - at a greater rate than had occurred under white presidents. Imperial propagandists repeatedly evoke the victims and abuses of the past in order to justify their own aggressive imperial interventions and support for the ‘land grabs’ and ethnic cleansing committed by their colonial allies - like Israel, among others. The victims and crimes of the past are presented as a perpetual presence to justify ongoing brutalities against contemporary subject people. The case of US-Israeli colonization of Palestine clearly illustrates how rabid criminality, pillage, ethnic cleansing and self-enrichment can be justified and glorified through the language of past victimization. Propagandists in the US and Israel have created ‘the cult of the Holocaust’, worshiping a near century-old Nazi crime against Jews (as well as captive Slavs, Gypsies and other minorities) in Europe, to justify the bloody conquest and theft of Arab lands and sovereignty and engage in systematic military assaults against Lebanon and Syria. Millions of Muslim and Christian Palestinians have been driven into perpetual exile. Elite, wealthy, well-organized and influential zionist Jews, with primary fealty to Israel, have successfully sabotaged every contemporary struggle for peace in the Middle East and have created real barriers for social democracy in the US through their promotion of militarism and empire building. Those claiming to represent victims of the past have become among the most oppressive of contemporary elites. Using the language of ‘defense’, they promote aggressive forms of expansion and pillage. They claim their monopoly on historic ’suffering’ has given them a ’special dispensation’ from the rules of civilized conduct: their cult of the Holocaust allows them to inflict immense pain on others while silencing any criticism with the accusation of ‘anti-Semitism’ and relentlessly punishing critics. Their key role in imperial propaganda warfare is based on their claims of an exclusive franchise on suffering and immunity from the norms of justice. Brandishing identify politics may have worked the first few times, but inevitably black, Latino, immigrant and all exploited workers, all underpaid and overworked women and mothers reject the empty symbolic gestures and demand substantive socio-economic changes - and here they find common links with the majority of exploited white workers. In other words, the existing propaganda techniques are losing their edge - the corporate media news is seen as a sham. Who follows the actor-soldiers and flag-worshipers once the game has begun? - A presidential "debate" in the USA was limited to the corporate and special interest parties' candidates. The third party candidates were not allowed (by rules set by the two corporate parties). It is thus not surprising that real issues were not discussed. For example the 2 million Americans incarcerated or the role of the Israel lobby in pushing for endless wars. - Shimon Peres, a war criminal with blood of thousands on his hands died and he was eulogized by the Western imperial powers (US and British governments had the highest level delegations) but also by representatives from four "Arab" governments. I had engaged Peres personally and embarrassed him in front of hundreds in April 2003 in Connecticut. 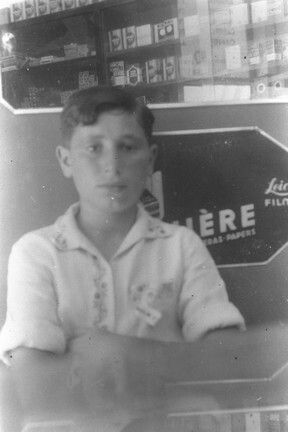 Peres was born as Shimon Perski in Vishniva, Poland (now Belarus). He and his parents came as colonizers under the Zionist banner to Palestine in 1934 and he joined the underground Israeli forces, the Haganah, and served as a chief of its manpower division in the 1940s. He is the architect of Israel’s nuclear program. Appointed in 1953 as director general of the ministry of defense, he immediately started exploring the nuclear development. In the late 1950s and early 1960s, Israel developed its nuclear program primarily with the help of France while maintaining the Peres doctrine of “ambiguity.” The US and Britain and other countries looked the other way. He was responsible for ethnic cleansing and numerous massacres (including teh infamous attack on a UN compound in Qana killing scores of civilians taking shelter there) He was given (with Rabin and Arafat) the Nobel Peace Prize for their infamous Oslo accords that transformed the PLO from a liberation movement to a subcontractor of the occupation. Nobel committee members signed a letter later regretting their decision as Peres continued his career of crimes. - Mr. Mahmoud Abbas shunning public sentiments and all common sense decided to go to the spectacle of the Peres funeral, warmly shake hands with another war criminal (Netanyahu) and then listen to speeches glorifying the apartheid colonial state of "Israel". By contrast, Palestinian members of the Israeli Knesset had dignity and did not attend the political spectacle. - The Jordanian signed a gas deal with Israel (as did the regime of Abbas before). Tens of thousands demonstrated against the normalization deals (both economic and political normalization). But the regimes may not care about sentiments of their people (we will wait and see). - In his speech at the UN and in opening the Bethlehem diaspora conference, Mr Abbas again regurgitated his usual talking points about his hands being stretched always for peace, that he is patient, that he hopes the world community will help bring peace, that they did a conference for Iran and they should do one for Palestine, etc. He failed to set time tables for "waiting" (enriching those around him for 25 years now "waiting" while most Palestinian suffer). He failed to mention that Iran is different since it has dignity and has power and does not grovel. He failed to mention how" waiting" is exactly what Israel wants as the status quo is very lucrative (a profitable occupation to the tune of $12 billion/year plus arms exports tested on Gaza people and $68 billion more from the USA just approved by Obama and security guaranteed by the occupied "Vichy" government). how far down things go. - Jordanian intellectual and activist Nahedh Hattar was gunned down after criticizing the Saudi regime's genocidal war on Yemeni and Syrian people. He had also posted a cartoon on facebook that mocked the "jihadists" (western supported) who are supposed to be in heaven enjoying women and wine after slaughtering innocents. I re-posted the cartoon on my facebook page not because I agree with its contents but because I believe in freedom of speech 100% and believe it critical to not succumb to threats of violence (terrorism). Our museum continues to progress rapidly. We received good news of further financial and other support (in kind, time). Birzeit student strike is over and we are back in classes. International visitors and volunteers continue coming to Palestine to work with us. I represented Bethlehem University as I was invited to give a talk on the status of research and education in Palestine at a conference about "Is there a crisis in Palestinian Universities" held at Birzeit University. I presented our example of making correct diagnosis followed by practical therapies including the fact that our new museum with two researchers and few students managed to publish 20 research works in two years. Our research paper on genotoxicity of recycling Israeli computers across the green line in teh Palestinian town of Idhna was accepted for publication. We created an institutional environment that educated thousands ranging from kindergarten children to university students to farmers and community members to international visitors. We travel regularly to marginalized areas to offer help and support. Our botanical garden is much better organized. I teach this semester at Bethlehem University, Bir Zeit University, Dar Al-Kalima College and Bethlehem Bible college. There is a lot of hope in Palestine and we stay very busy at the museum, in doing clinical work, in teaching, in activism, writing and more. This hectic schedule keeps us hopeful and is the best antidote to being depressed because of the idiocy of politicians (American, Israeli, Saudi, Palestinian etc).